Looking to build your own home in Vermont? An ice dam is essentially a group of oversized, heavy icicles hanging from the edge of a roof that develop when snow on the roof melts and then refreezes near the gutters. They make look cool, but more often than not, they cause damage to roof shingles, which can in turn devalue your property or cost you thousands of dollars in roof damage. The most common causes of ice dams are inadequate insulation in the home and poor roof ventilation. 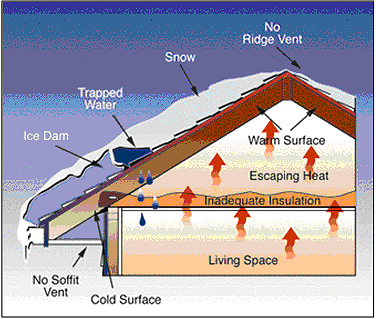 Ice dams most often occur in ranch style houses or houses with low roof slopes and large overhangs. They occur when snow is present on the roof and the outside temperature is below freezing (pretty much a given for us here in Vermont!) Homes with poor insulation allow heat to escape from the living quarters into the attic. If the roof system is not properly ventilated, the heat will build up in the attic and warm the roof deck, melting the snow above. When the melted snow reaches cooler roof areas, usually the gutters or areas near the overhang (eaves) it will refreeze. This freeze-thaw process can damage shingled roofs since the ice can travel "upslope" and get underneath the shingles. Installing new shingles alone will not prevent ice dams. Prevention only occurs when the entire roofing system is addressed, including attic insulation and roof ventilation. Ideally, the temperature in the attic space should be close to the same temperature as the outside air. Adding insulation to your attic will minimize the heat that escapes from the living space into the attic. Additionally, electric outlets, plumbing vents, furnace stacks, and bathroom vents can allow heat to escape into the attic. Proper roof ventilation allows that heat to escape and prevents your roof deck from warming. The freeze-thaw process that results in ice damming is unlikely to occur on a roof that is properly ventilated. It is also important to keep your roof free from heavy snow during the winter months to prevent ice damming, as well as, worst case scenario, a roof cave in. Please be very careful if you decide to take on this dangerous job yourself! You could use a roof rake, but be careful not to damage your shingles. I wouldn't recommend climbing up on the roof yourself, so it's best to hire professionals who have prior experience with this task and who are insured in case of any accidents. Contact us and we'd be happy to recommend a local, quality roofer, contractor or handyman to help you clear the snow and icicles off your roof this winter!